It has now been over 25 years since coach Paul Bear Bryant died, yet his lgreat egendary status and influence continues to grow as the years past by. 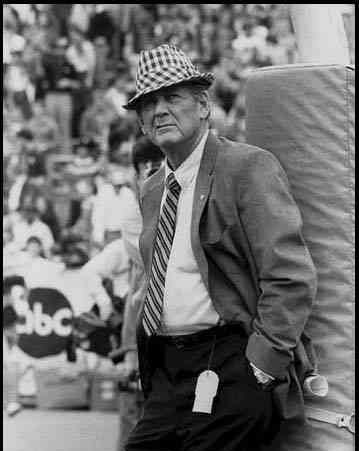 When coach Paul Bear Bryant retired from coaching at the University of Alabama following the 1982 football season, coach Bryant was college football's most winningest coach ever with 323 victories. His Alabama Crimson Tide teams' won a whopping 6 national championships and a stunning 13 Southeastern Conference titles. Simply put, coach Bear Bryant was one of the greatest football coaches of all-time. Below are some of coach Bryant's quotes regarding life, leadership, success, and football. "Mama wanted me to be a preacher. I told her coachin' and preachin' were a lot alike." "But it's still a coach's game. Make no mistake. You start at the top. If you don't have a good one at the top, you don't have a cut dog's chance. If you do, the rest falls into place. You have to have good assistants, and a lot of things, but first you have to have the chairman of the board." "If anything goes bad, I did it. If anything goes semi-good, we did it. If anything goes really good, then you did it. That's all it takes to get people to win football games for you." "I think the most important thing of all for any team is a winning attitude. The coaches must have it. The players must have it. The student body must have it. If you have dedicated players who believe in themselves, you don't need a lot of talent." "The idea of molding men means a lot to me." "You must learn how to hold a team together. You must lift some men up, calm others down, until finally they've got one heartbeat. Then you've got yourself a team." "If wanting to win is a fault, as some of my critics seem to insist, then I plead guilty. I like to win. I know no other way. It's in my blood." "Get the winners into the game." "The old lessons (work, self-discipline, sacrifice, teamwork, fighting to achieve) aren't being taught by many people other than football coaches these days. The football coach has a captive audience and can teach these lessons because the communication lines between himself and his players are more wide open than between kids and parents. We better teach these lessons or else the country's future population will be made up of a majority of crooks, drug addicts, or people on relief." "Sacrifice. Work. Self-discipline. I teach these things, and my boys don't forget them when they leave." "I'll never give up on a player regardless of his ability as long as he never gives up on himself. In time he will develop." "Set goals - high goals for you and your organization. When your organization has a goal to shoot for, you create teamwork, people working for a common good." "Don't talk too much. Don't pop off. Don't talk after the game until you cool off." "You have to learn what makes this or that Sammy run. For one it's a pat on the back, for another it's eating him out, for still another it's a fatherly talk, or something else. You're a fool if you think as I did as a young coach, that you can treat them all alike." "If a man is a quitter, I'd rather find out in practice than in a game. I ask for all a player has so I'll know later what I can expect." "Find your own picture, your own self in anything that goes bad. It's awfully easy to mouth off at your staff or chew out players, but if it's bad, and you’re the head coach, you're responsible. If we have an intercepted pass, I threw it. I'm the head coach. If we get a punt blocked, I caused it. A bad practice, a bad game, it's up to the head coach to assume his responsibility." "It's awfully important to win with humility. It's also important to lose. I hate to lose worse than anyone, but if you never lose you won't know how to act. If you lose with humility, then you can come back." "Losing doesn't make me want to quit. It makes me want to fight that much harder." "The biggest mistake coaches make is taking borderline cases and trying to save them. I'm not talking about grades now, I'm talking about character. I want to know before a boy enrolls about his home life, and what his parents want him to be." "What are you doing here? Tell me why you are here. If you are not here to win a national championship, you're in the wrong place. You boys are special. I don't want my players to be like other students. I want special people. You can learn a lot on the football field that isn't taught in the home, the church, or the classroom. There are going to be days when you think you've got no more to give and then you're going to give plenty more. You are going to have pride and class. You are going to be very special. You are going to win the national championship for Alabama." "I'm no innovator. If anything I'm a stealer, or borrower. I've stolen or borrowed from more people than you can shake a stick at." "There is no sin in not liking to play; it's a mistake for a boy to be there if he doesn't want to." "I'm no miracle man. I guarantee nothing but hard work." "Don't overwork your squad. If you're going to make a mistake, under-work them." "Be aware of "yes" men. Generally, they are losers. Surround yourself with winners. Never forget - people win." "If there is one thing that has helped me as a coach, it's my ability to recognize winners, or good people who can become winners by paying the price." "You take those little rascals, talk to them good, pat them on the back, let them think they are good, and they will go out and beat the biguns." "If you whoop and holler all the time, the players just get used to it." "I know what it takes to win. If I can sell them on what it takes to win, then we are not going to lose too many football games." "If you want to coach you have three rules to follow to win. One, surround yourself with people who can't live without football. I've had a lot of them. Two, be able to recognize winners. They come in all forms. And, three, have a plan for everything. A plan for practice, a plan for the game. A plan for being ahead, and a plan for being behind 20-0 at half, with your quarterback hurt and the phones dead, with it raining cats and dogs and no rain gear because the equipment man left it at home." "My approach to the game has been the same at all the places I've been. Vanilla. The sure way. That means, first of all, to win physically. If you got eleven on a field, and they beat the other eleven physically, they'll win. They will start forcing mistakes. They'll win in the fourth quarter." "Scout yourself. Have a buddy who coaches scout you." "But there's one thing about quitters you have to guard against - they are contagious. If one boy goes, the chances are he'll take somebody with him, and you don't want that. So when they would start acting that way, I used to pack them up and get them out, or embarrass them, or do something to turn them around." "There's a lot of blood, sweat, and guts between dreams and success." "People who are in it for their own good are individualists. They don't share the same heartbeat that makes a team so great. A great unit, whether it be football or any organization, shares the same heartbeat." "I told them my system was based on the "ant plan," that I'd gotten the idea watching a colony of ants in Africa during the war. A whole bunch of ants working toward a common goal." "We can't have two standards, one set for the dedicated young men who want to do something ambitious and one set for those who don't." "I honestly believe that if you are willing to out-condition the opponent, have confidence in your ability, be more aggressive than your opponent and have a genuine desire for team victory, you will become the national champions. If you have all the above, you will acquire confidence and poise, and you will have those intangibles that win the close ones." "If you believe in yourself and have dedication and pride - and never quit - you'll be a winner. The price of victory is high but so are the rewards." "Don't ever give up on ability. Don't give up on a player who has it." "A good, quick, small team can beat a big, slow team any time." "I have always tried to teach my players to be fighters. When I say that, I don't mean put up your dukes and get in a fistfight over something. I'm talking about facing adversity in your life. There is not a person alive who isn't going to have some awfully bad days in their lives. I tell my players that what I mean by fighting is when your house burns down, and your wife runs off with the drummer, and you've lost your job and all the odds are against you. What are you going to do? Most people just lay down and quit. Well, I want my people to fight back." "If they don't have a winning attitude, I don't want them." "I have tried to teach them to show class, to have pride, and to display character. I think football, winning games, takes care of itself if you do that." "I always want my players to show class, knock'em down, pat on the back, and run back to the huddle." "I tell young players who want to be coaches, who think they can put up with all the headaches and heartaches, can you live without it? If you can live without it, don't get in it."